With the success story of the “American Field Service”, from a medevac squad established by a group of American youth living in Paris during the World War I in 1914, to the international exchange student organisation since 1946, “AFS” is the world’s most respectable international exchange student project with a large network of exchange students and volunteers all around the globe. Cultural exchange is one proven way onto building international understanding, “AFS Thailand” was therefore established in 1962, following the long-standing philosophy of the AFS International in campaigning for the peace on earth by giving out opportunities for students, year after year, to connect to the world of diverse cultures. 15 brave young Americans volunteered and established a medical care centre in the suburb of Paris. They stood out amidst the rain of German mortar fire in World War I, driving ambulances to transport the wounded, regardless of their nationalities and the side they take. AFS Foundation Thailand was established with approval from the cabinet of the Royal Thai Government. Fourteen Thai students received fully-funded scholarships from USIS (United States Information Service) to set out on a year-long cultural exchange trip to the United States of America. the AFS Thailand was morphed into an “International Organisation”, expanding its coverage all around the globe – Australia, New Zealand, Canada, Latin America, and Europe, under the new name of “AFS International Intercultural Programs”. 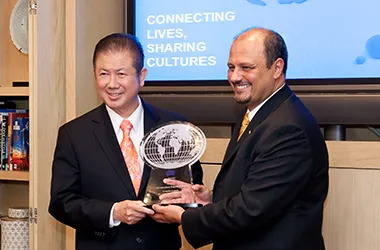 AFS Thailand was voted by the network of AFS Network in more than 50 countries as one of the five best administered and organised, winning the No.1 in Overall Quality, and High Growth Potential awards. The organisation also received the same awards in 2004, and again in 2008. AFS Thailand was honoured in being the host of the AFS World Congress 2012 in Thailand, celebrating its golden jubilee of the foundation.